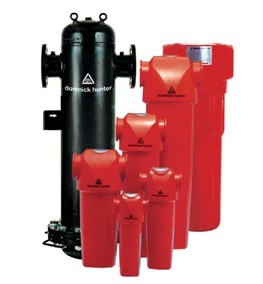 Coalescing compressed air filters are probably the single most important items of compressed air treatment equipment in a compressed air system. They are designed to remove aerosols (droplets) of oil and water using mechanical filtration techniques, and also to remove solid particulate to very low levels (as small as 0.01micron in size). Installed in pairs, the first compressed air filter is a ‘general purpose filter’ which protects the second ‘high efficiency filter’ from bulk contamination. The dual filter installation from Parker domnick hunter ensures a continuous supply of high quality compressed air with the additional benefits of low operational costs and minimal maintenance. Dust removal compressed air filters are used for the removal of dry particulates and micro-organisms. They provide identical particulate removal performance to the equivalent coalescing filter and use the same mechanical filtration techniques to provide up to 99.9999% particle removal efficiency. The unique design of the OIL-X EVOLUTION filter provides multiple port sizes to give greater application flexibility. A ‘clean change’ element design ensures that service technicians do not have to directly handle contaminated filter elements during maintenance. 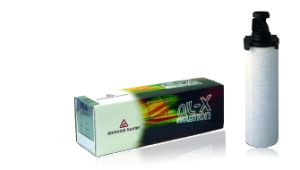 Ordinary compressed air filters have always consumed too much energy, as they are by design, a restriction to air flow. During their working life, this restriction increases dramatically, and typically over one year, can consume more energy than they are worth. Technically, service life is dependent upon differential pressure. Most manufacturers recommend a replacement filter element at between 500 mbar (7 psi) and 700 mbar (10 psi) differential. This will cost you a massive 5% extra in compressor energy. In fact you are driving your compressor with the brakes on!